The sample is one of the five activities from the full product. It is an experiment that students conduct to experience what happens when an image falls on the 'blind spot' of the eye. 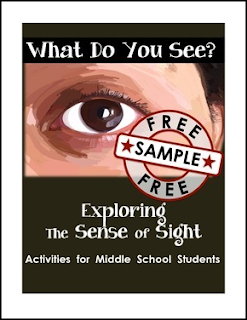 Students will experience an optical illusion which can be discussed in class to determine whether the illusion is the result of the brain "ignoring" part of an image, or whether the brain is "filling in" what it perceives to be missing from the image. The activity includes a writing prompt for students to complete. They are asked to provide evidence to support their opinion as to whether the brain is "ignoring" or "filling in". I hope you enjoy this free sample, and naturally I'm hoping you like it enough to return to purchase the full product! Click on the green star near my logo to follow my TpT store and receive notifications of new product releases. You won't get annoying emails every day if you do that! :) You'll only get an email if I have just released a new product! Did you know you can get credits to use on any purchase in any TpT store just by leaving feedback? After you've used a product from a TpT seller, please take a minute to return to leave feedback. It's very much appreciated, and it's an easy way to earn credits that save you money on your next purchase!